This mix of lettuce favorites is usually harvested young and mixed for salads. Can also be separated after sprouting and transplanted to grow to maturity (approximately 40 -50 days). Plant enough each planting to last about a week at harvest time. If you like salad, start with about 5 feet of row and adjust each planting as needed. This mild mix contains 20% Black Seeded Simpson, 20% Green Salad Bowl, 20% Oakleaf Lettuce, 20% Red Salad Bowl, 20% Romaine. 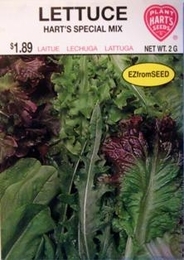 1lb of Lettuce seed needed per acre. 4oz needed per acre if using transplants. On average, 1oz of seed can produce 1500 Lettuce plants.